Caring for someone with dementia can be physically and emotionally tiring and stressful. Families and carers can easily become isolated, particularly if they are unable to leave the person they are caring for. Regular breaks mean that you can have a rest, go out, attend to business or go on a holiday and gives carers something to look forward to and experiences to look back on. Breaks are important for the same reasons for people with dementia. They can mean time for socialising, meeting other people or for doing activities they enjoy. Breaks can also provide an opportunity for getting used to other people other than their immediate family providing support and caring. The Australian and State governments fund a number of respite programs for regular, occasional and emergency breaks. They include out of home respite, in home respite and residential respite. Respite can also be provided in local day activity centres by attending planned activity groups. Some centres offer specialised activities for people with dementia. The care offered by day centres ranges from a few hours to several days a week. Some centres offer extended hours, weekend or overnight care. Another way to take a break is to have a care worker come to the house to enable you to do things outside the house. They may also accompany the person with dementia to an activity that they enjoy. This is often called inhome respite as it begins and finishes at home. Respite can also be used to provide care in an emergency or arranged for a longer period of time in a residential facility. To use residential respite, the person with dementia must be assessed by an Aged Care Assessment Team (ACAT) to determine the level of care required. 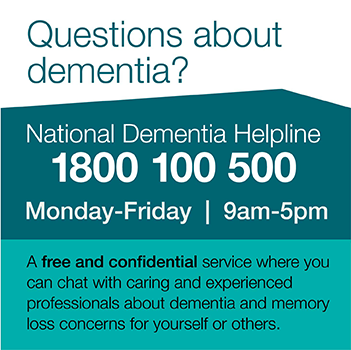 Contact details for your local ACAT can be found in the Age Page at the front of the telephone directory or contact the National Dementia Helpline on 1800 100 500. It is common for people with dementia to find new environments and new people unsettling. Because of this it is important to plan ahead for a positive respite experience. Many families and carers have found it useful to start using regular respite as early as possible so that everyone can get used to sharing dementia care. It is often best to start with small breaks and build up to longer ones. You will know best how far in advance to tell the person with dementia about the break. Reassure them if they are anxious and make sure that they know that you are positive about the break, even if you’re feeling a little anxious yourself. Talking with other families and carers about ways they’ve managed to make respite a positive experience may give you some practical ideas for managing. If you just want to know what’s available – just ask. The Government is committed to providing respite care and has funded many different types of respite to help carers. Many organisations will help you take a break. These are usually called respite care services and include church groups, local councils and community groups. Commonwealth Respite and Carelink Centres are specifically funded by the Australian government to let you know what is available for you and the person you are caring for. They will help you find respite care in your local area and can answer your queries about types and costs of respite. Contact the Commonwealth Carer Respite Centre on 1800 052 222. Commonwealth Carer Resource Centres provide carers with information and advice about relevant services and entitlements. Contact your closest Commonwealth Carer Resource Centre on 1800 242 636. If the type of respite you want isn’t available in your local area let someone know. Contact Dementia Australia or carer advocacy groups for advice on how to raise the issue of unmet respite needs. People often find that when respite needs are not met, informing local press and politicians can make a difference now and in the long term.